BILLFISH: We had an up and down week in Cabo, all the right elements are present, lots of bait, good color water, temperature a little high at 73 F, but the fish were hard to locate. Added to this was the fact that there were fewer anglers in town this week, perhaps half of the previous week, so less boat out fishing means less fish being caught. It was rare that anybody caught more than one marlin but 28 ft. Adriana managed to catch and release two up to 120 lbs. plus a tiny dorado for the Baker family from Coleville, Washington at Elias Calles on the Pacific side on February 21st. One of their fish took a live caballito & the other a petrolero lure. This ended up being the best day of the week for marlin with pretty much every boat catching a single marlin plus a few dorado. On February 22nd, Adriana was one of the only boats to catch marlin, this time at Migrino for Mallorie Edenfeld who also caught a 20 lb. Dorado. 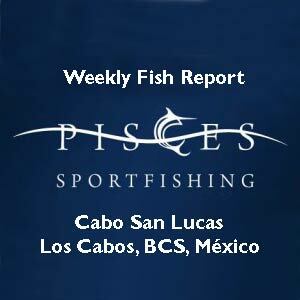 This entry was posted in cabo san lucas, Fish Reports, Pisces Sportfishing, sportfishing on March 2, 2015 by Roger.